Michigan has much to celebrate. Fortunately for visitors, we have no problem tooting our own horn, and not just at our vintage car festivals. In addition to cherry red Ford Mustangs, we’re home to the National Cherry Festival in Traverse City. And some of our dreamiest cruises are without wheels. Hear that romantic signal sound as your ship comes into port. Sail along snow-covered slopes as sleigh bells ring. Delight in the echoes of your own cries as they wash into a thrilling whitewater rafting adventure. Oh, and honk twice if a fudge festival sounds like it would hit the spot. 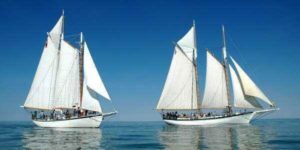 The Great Lakes State boasts baskets of farm-fresh goodness, bevies of cool bands and music festivals and enough maritime heritage to power a fleet of boating bashes. You don’t need to listen carefully to catch the sound of Michigan having fun. We’re not quiet about it. Let us show you how to join the merriment. Join us at Zehnder's Restaurant. our special events include Vaudeville Night, Silent Movies, Seminars, Meet the Artists, and a Ragtime Dinner Concert. Mackinac Island is the place to celebrate the finest equine event of the year.